Okay, this is approximately the way Diana (Diana L. Paxton) told it. But the scholar of whom I speak was more fortunate than the rest, for she used to escape from the tower from time to time and go down into the town, where she met many interesting people. And some of these folk belonged to a tribe called "fandom," and they too read many books and wrote many papers, and they published them in loose journals printed on coarse wood-pulp paper. And the scholar, who had some skill as an artist, drew pictures of knights and ladies and elves and dragons, and these appeared in the wood-pulp paper journals. And in this tribe were two young men with whom the scholar became acquainted; and they were beautiful young men, one dark and one fair, and both with eyes the color of summer heaven. And on a day the scholar went to visit the young men in their home, and she saw hanging on the wall two bright swords and two well-wrought shields emblazoned with devices of heraldry. And she said, "What do you do with those?" And the young men replied, "WE FIGHT WITH THEM." And the scholar said, "How splendid. Next time you practice, I shall come and draw pictures of you." And on many a day the young men met to practice their skills with sword and shield, and the scholar covered many sheets of wood-pulp paper with their likenesses. "You could hold a tournament here." "Look! Here the fighters could fight, and here the spectators could sit, and if there were too many of them some of them could stand behind the wall there, safe from random blows. You could do it. You could hold a tournament here." "I've had the most wonderful idea. TALK ME OUT OF IT!" And she told her housemates her idea, and they all answered, "That's wonderful! We'll all help!" 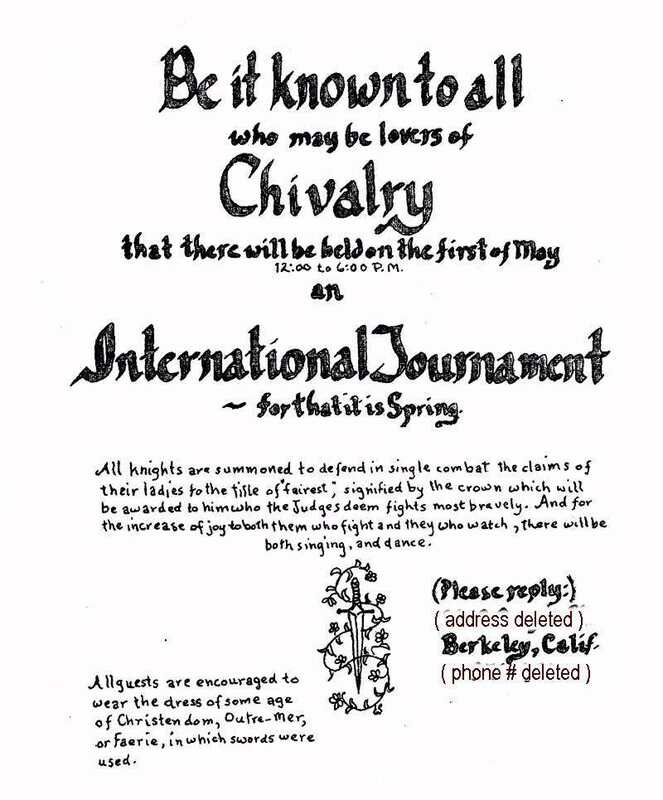 And so they chose the First of May as the date of the tournament, and they caused to be printed on many sheets of wood-pulp paper the message, "Come to a Tournament--for that it is spring." 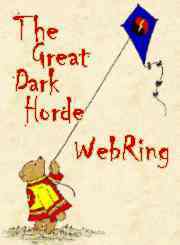 And the message was broadcast all round the ivory tower and the town besides. And on the day, at the stroke of noon, being the time set to begin the tournament, the scholar set foot outside her door, and there was no one there. And half an hour later, she stepped outside her door again, and there were fifty people there. Then came Jon deCles in the robes of an Archbishop, and intoned, "Ecce Eduardus Ursus nunc occipite post Christophorum Robinem tump-tump-tump scalis descendens," and all sang "Amen." And Elizabeth Pope, Doctor of Philosophy, was named Judge of the Lists, and the knights and squires came forth to do battle, and many brave deeds of swordplay were seen. And young David the Herald fought so well that Sir Siegfried von Höflichkeit dubbed him Knight there upon the field. And Marynel of Darkhaven, being then but young, had bidden her father Beverly Hodghead to come to the place half an hour after she did, in case she wished to return home; but when he saw the noble company and the deeds that were being done, he hurried home and returned again in haste, bringing the crossbow that he had made for himself. And he fired a bolt against one of the shields, and behold! the point curled up upon itself like a little shell. And a certain Knight was named victor, and he crowned his Lady with a wreath of roses. And then all said to one another, "What shall we do next?" And it was answered generally thus, "This is Berkeley. Should we not be protesting something?" And they marched up and down Telegraph Avenue protesting the ugliness of the twentieth century, from which they had escaped that day. And then, passing by the market, they bought roasted chickens and bottles of wine, and returning to the field of the tournament, they built a fire and sat around it, eating chickens and drinking wine and telling tales, long into the night. And the scholar, sitting by the fire, said to herself, "This happened. This really happened. The Last Tournament *wasn't* in 1839, it happened today; and someday, years from now, I shall be able to tell my grandchildren that once, just once long ago, this happened." But the man seated beside her was saying to the man next to him, "Now, *next* time I'm going to hit him like THIS!" The Backyard Tournament subsequently became a Large Corporation.